As gardening season gets into full swing and some parts of the country are experiencing height of summer temperatures already, you probably have begun your battle with garden pests. There's nothing worse for a gardener than to see all your hard efforts being destroyed by insects seemingly overnight. The market is full of pesticides, but what if you are concerned about how those toxic chemicals will affect your children and your pets? Or the safety of the fruits and vegetables you will be eating? There is some good news. You can find the solution to many garden pests in your kitchen. Aphids: Tiny soft-bodied, pear-shaped insects that may be green, yellow, black, gray or pink, aphids multiply like crazy and do can a lot of damage in a hurry. They show up on new shoots, crowns and undersides of leaves on fruit and vegetable plants, ornamentals, flowers and shade trees. Aphids have long antennae and have two short tubes that project backward from the tip of their abdomens. Some types have long transparent wings that they hold over their backs.Aphids remove a plants sap, and symptoms of an infestation are yellowish spots, curled leaves or glossy, sticky leaves. In addition, a sooty mold that hampers photosynthesis may develop on leaves. A natural remedy: Combine the grated rind of one lemon or orange with one pint boiling water. Let the solution steep overnight, before straining with a coffee filter. Spray the solution thoroughly on leaves and undersides of leaves. Reapply every four to seven days as needed. Another option: Mix together a teaspoon of vegetable oil, a teaspoon of dishwashing liquid and a cup of water. Spray the entire plant thoroughly, especially the undersides of leaves. Wait a few hours, then rinse off the solution with a garden hose. Repeat every few days as needed. Slugs and snails: These creatures feed at night, preferring damp conditions. Although they move along the ground, they can climb up your plants and consume tender new growth and seedlings. 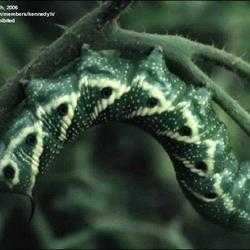 You may spot them in the early mornings or late evenings or notice their glistening, slimy trails on some hard surfaces. 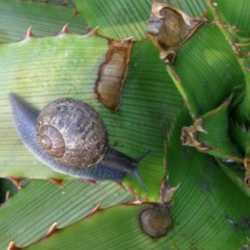 Slugs and snails tend to hide in damp, shaded areas. You can make your garden less inviting to them by removing weeds and any other debris and by watering in the morning rather than at night. An alternative to insecticides: Slugs and snails are attracted to beer. You can trap them in shallow pans set throughout your garden. Try burying several empty tuna or cat food cans up to the rim and then filling them with beer. At night, the creatures will crawl into the beer and drown. You can throw out the cans in the morning and replace them. Another option: Place a wooden board or two in your garden. In the morning, you will find snails and slugs that have taken refuge there overnight. You can simply scrape them into a trash bag that you securely tie before placing in your garbage can. Spider mites: These tiny pests can cause substantial damage to plants. 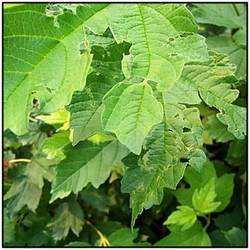 Leaves damaged by spider mites appear often have speckled green or light-colored spots. You can confirm spider mite damage by tapping a leaf while holding it over a piece of white paper. Then examine the paper with a magnifying glass. A safe remedy: Mix three tablespoons of dishwashing soap with one gallon of water. Thoroughly wet plant leaves, reapplying every five days as necessary. Another option is to apply rubbing alcohol to the leaves with cotton balls every five days or so. With each application of either solution, wait a few hours, and then wash it off with a garden hose. Earwigs: Also called pincher bugs, earwigs feed on decomposing plants and wet leaves. They can infest your flower beds and garden, and they may even invade the inside of your home as they seek a cool refuge in the summer. A natural remedy: Roll up sheets of wet newspaper and lay them around your garden in the evening. Earwigs feed at night and will crawl into the wet paper early in the morning for shelter. Before the paper has the chance to dry out, collect them  bugs and all -- in a trash bag. Tie the bag securely, making sure there are no openings, and place it in your outdoor trash can. Ants: Look in your kitchen cabinets for safe remedies for an ant infestation. Sprinkle powdered red chili pepper, paprika, cinnamon or dried peppermint around the plants or areas you do not want ants to cross. * pour boiling water into the entrance of an ant colony early in the morning after a rainy night. * sprinkle small amounts of vinegar around plants that are affected by ants. * pour a small amount of corn meal near the entrance to an ant colony. Ants will eat the corn meal and bring it back to the colony for others. After consumption, the corn meal expands in their stomachs, killing them. By using these alternative pest control measures, you will not only save the money from the purchase of expensive chemicals, but you will keep your kids and pets safe. In addition, you will not be adding dangerous chemicals to the air and the groundwater surrounding your home. There are many more natural pest remedy ideas. Be sure to let us know what has worked for you with in your garden.